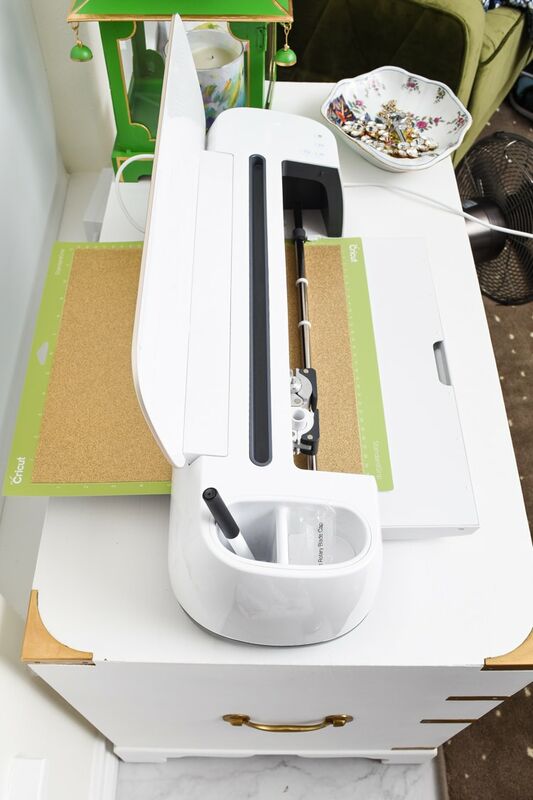 I spent all last weekend crafting with my Cricut Maker AND the EasyPress to create three home décor projects. 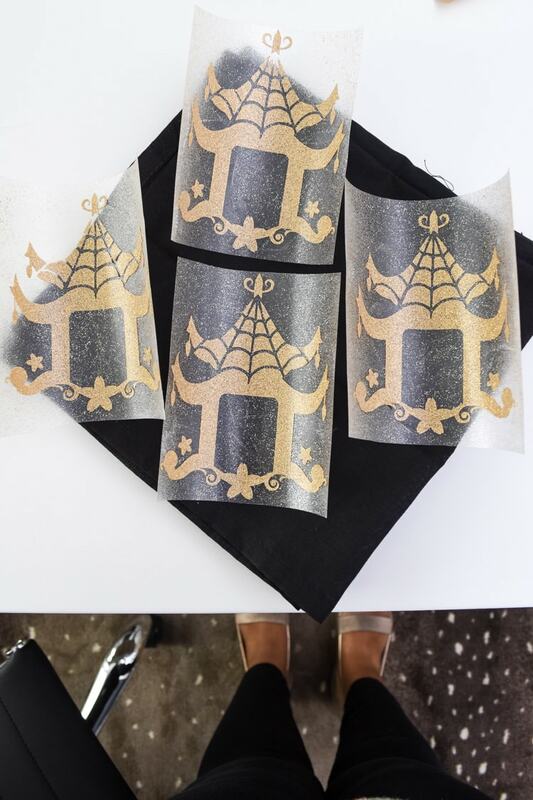 Today’s project will be how to create DIY monogrammed napkins using Cricut’s iron-on glitter vinyl. 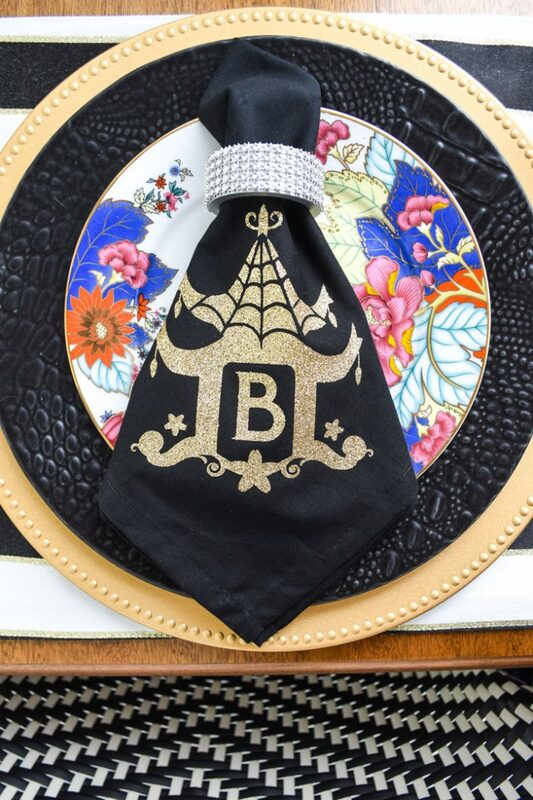 You all know I love to decorate my table, and I love to use cloth napkins. 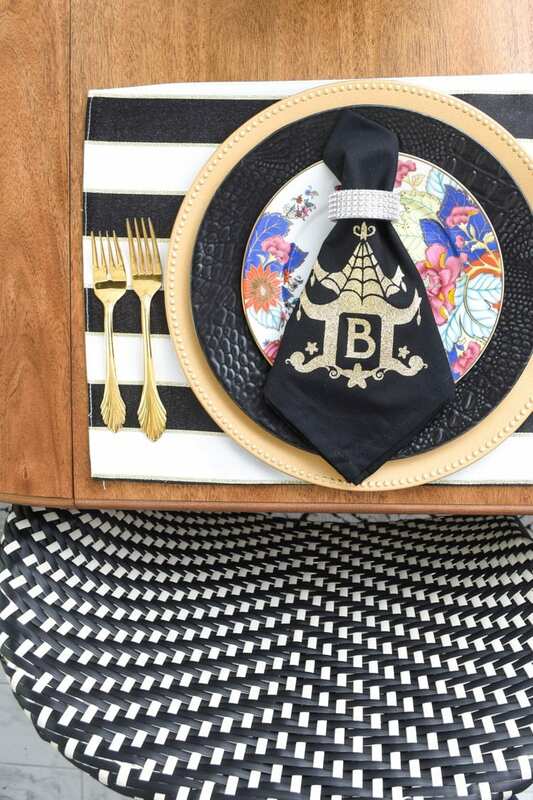 I feel it elevates the look and it’s a fun way to inject a pop of color. 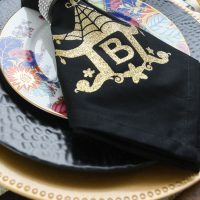 I’ve had these black napkins for a while now, so I decided they’d be perfect to use for this project to spruce them up a bit. Back during all my Christmas crafting, I created a custom pagoda design with my initial to use on a tumbler. I saved my vector file as an SVG, uploaded it into Cricut’s Design Space and swapped the “M” for a “B” to create custom monogrammed napkins. 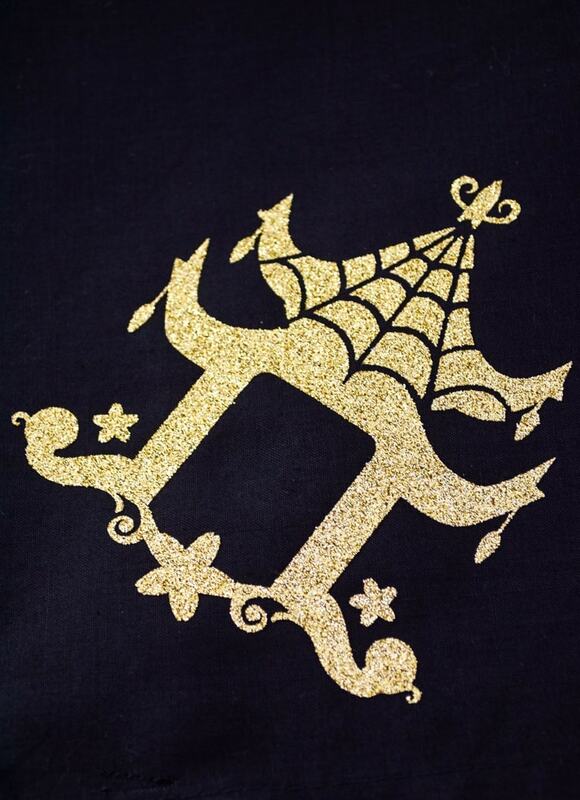 Gold is a prominent color in everything I do, so I used the glittery gold iron-on vinyl for this project. This was my first time ever using an iron-on vinyl product, and using Cricut’s tips it was a flawless experience. The first thing I did was fold my napkins into a square and measure across. This helped me decide how big to make my pagoda artwork in the Design Space. After that, I got my pagoda uploaded into the design space, swapped the initials, and arranged four on the canvas. 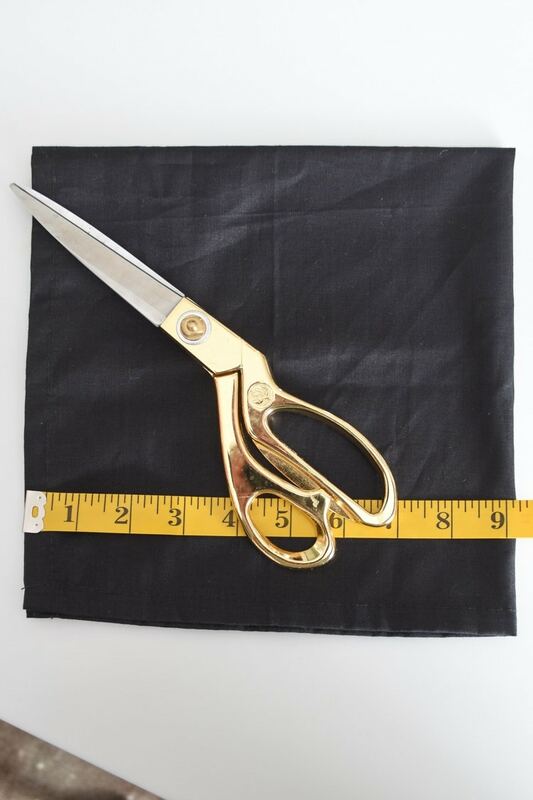 Before I cut it, I made sure to MIRROR my design (this is a setting that appears before you cut) so that the monogram would be facing the correct way when ironed on. I put my sheet of iron-on vinyl SHINY SIDE DOWN onto the standard grip mat and waited patiently for my Cricut Maker to do its thing. Once it was done, I decided to put my Cricut Bright Pad to use to help me weed out the parts of the vinyl that I did not want to iron on. The Cricut weeding tools were SUPER handy for this process! The Bright Pad was helpful for the intricate details of the design. I then had my four individual pagodas ready for their iron-on debuts. As you can see, there’s no monogram in these photos… that’s a rookie mistake on my part. I chose a super thin font that was difficult to weed out. I ended up finding a thicker font and cutting four B’s on a spare piece of the vinyl to complete the napkins. Lesson learned! Now, it’s time to set-up an assembly line. I had my napkins and pagodas, followed by an EasyPress mat (I later switched to the larger one for ease) and the EasyPress 2 on the right hand side. 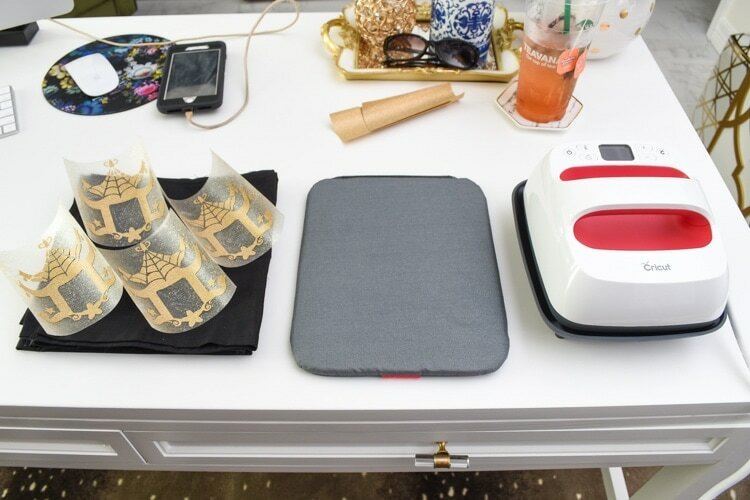 Before starting to iron-on the pagodas, I used the EasyPress to iron my napkins so they’d be pressed and crisp. I used the settings from this handy interactive guide to know what temperature to use. The EasyPress couldn’t be any easier to use. 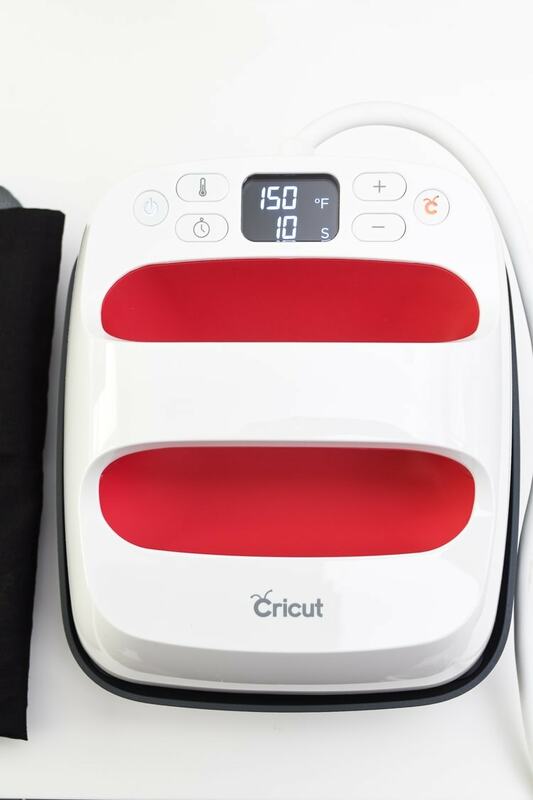 It heats up quickly, has a base to protect to your surface and the buttons are incredibly easy and self-explanatory. 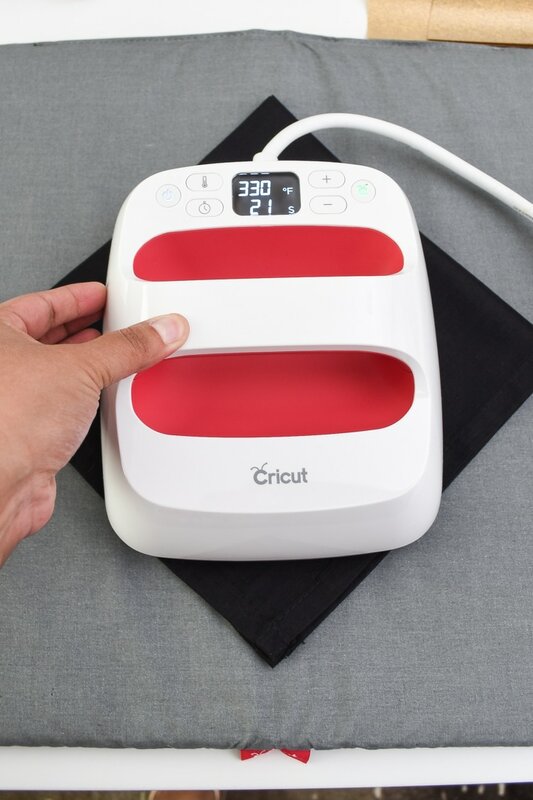 Pairing the EasyPress with the mat is also a no brainer—you absolutely do not want to ruin your countertops or desk tops with the heat emitted from this and ironing boards can be a bit flimsy. I love the easiness of the mat. After pressing my napkins, I measured to see how far I wanted the design to be from the corner of the napkin. I decided on three-inches, but in hindsight I would have made the pagoda slightly less wide and placed it at the two inch mark. I ironed the part of the napkin I was going to place the design for five minutes (this is a pre-heat of sorts). Then I applied the pagoda using the EasyPress and gentle pressure for the length of time and temperature specified in their guide. Then you flip it over and apply heat to the backside of the design. Do not leave the EasyPress 2 unsupervised around children or pets! It gets super, duper hot. About the napkins: Prewash the item before application without fabric softener. Allow 24 hours after application before washing. Wash and tumble dry inside out. Do not bleach. 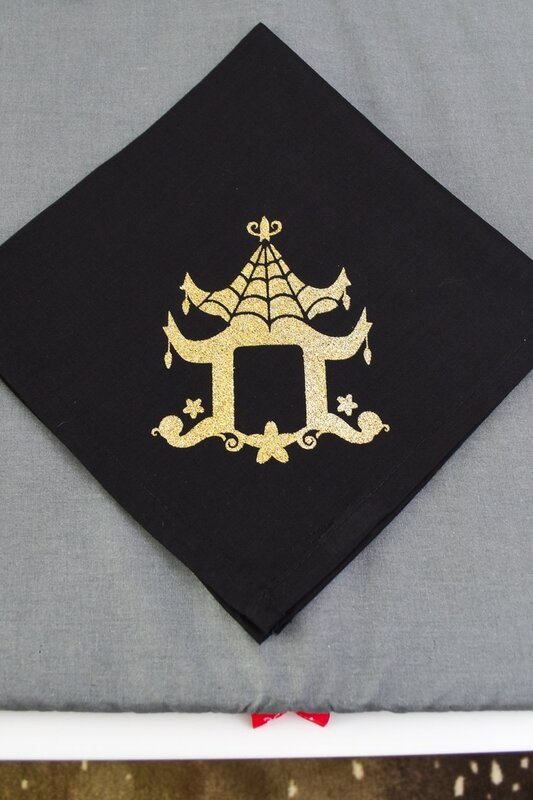 At first, I was REALLY PARANOID that all the specks of glitter on the protective, shiny liner were going to end up on my cloth napkins (which is why I used cheap $2 napkins), but literally only the design itself transferred over. I couldn’t be more thrilled with how easy this process was, and now I want to iron-on all the things! 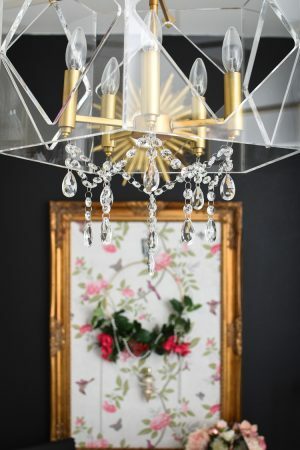 This really was an easy project—you can use the EasyPress and Cricut Maker to create custom décor, gifts and even apparel. I can never find cute typography workout shirts, and now I have a super easy way to make my own. 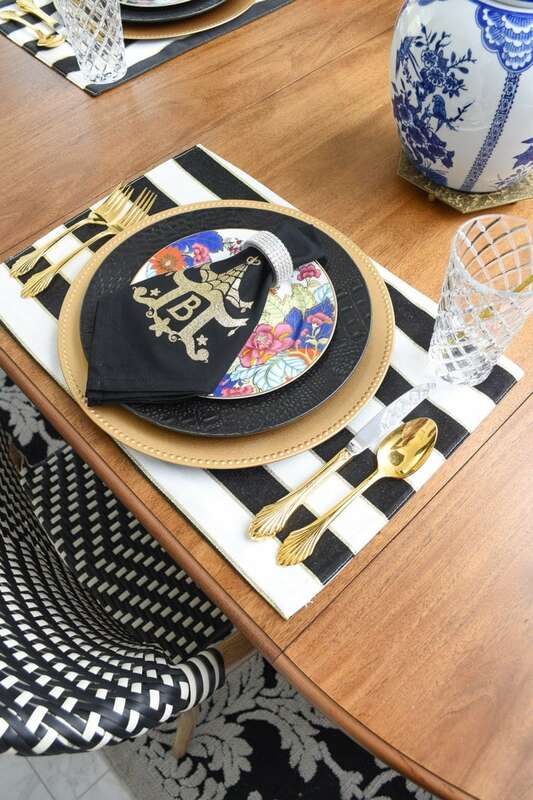 These napkins look so chic against my colorful tobacco leaf china plates and bold, striped placemats. 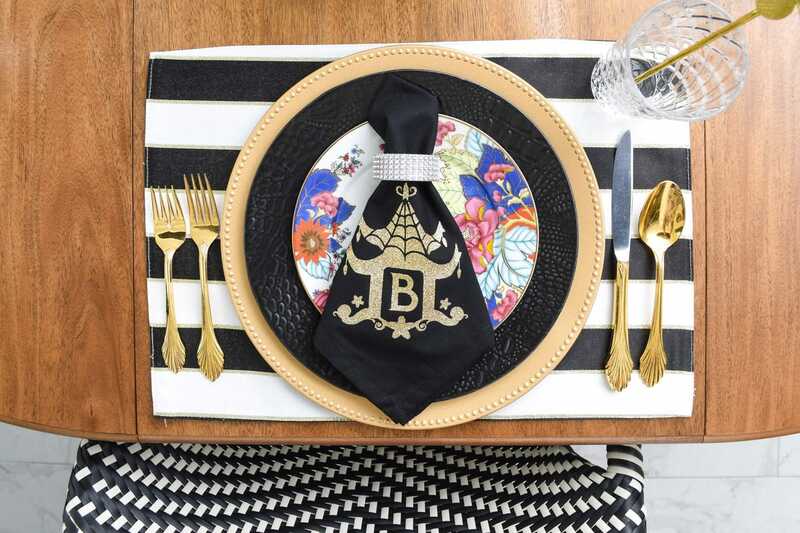 Hey, I could totally monogram these placemats, too. I hope this tutorial has you inspired to tackle a project. 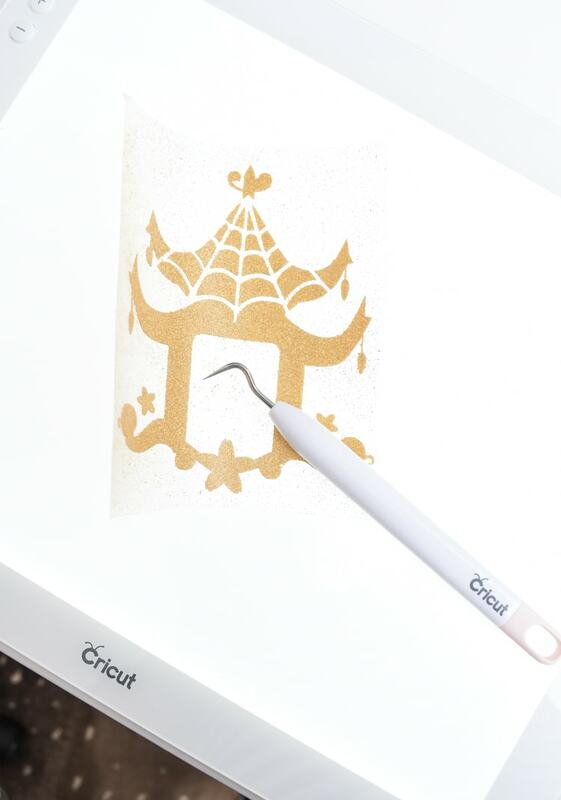 So many of you said you have a Cricut and just haven’t used it—I encourage you to dust it off and see what you can whip up this weekend. Need more dining room inspiration? 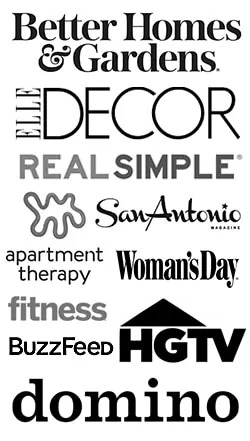 Check out my spring tablescape decor from last year or my spring home tour! 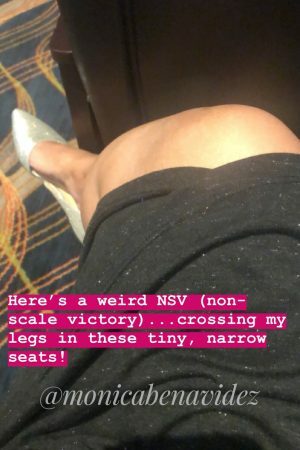 My gosh I love those!!! 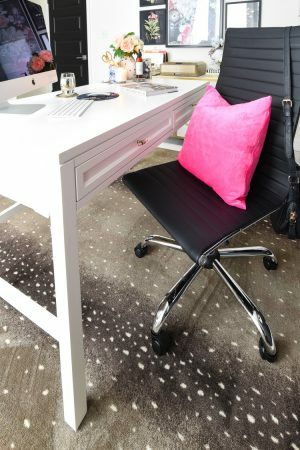 You’re really creating some beautiful things with that cricut machine…hmmmm.. you got me thinking I might need one in my life..(as soon as I create an office space lol).. great job Monica!